Bryozoa is a phylum of miniature, sessile, colonial invertebrates characterized by a crown of tentacles called the lophophore that facilitates ciliated filter feeding. You can see several individual zooids with extended lophophores in the picture below. Most bryozoans brood their embryos, but where and how they brood varies. Bugula pacifica, a cheilostome commonly known as the spiral bryozoan, broods one embryo at a time inside shallow ovicells; specialized calcified brood chambers visible here as semi-circular structures attached to maternal zooids. The ovicell is produced jointly by the two neighboring zooids - the maternal zooid and the next distal zooid (Giese et al. 1947). This is a close up view of a maternal zooid and an ovicell in Bugula pacifica. What looks like the head of a bird above the ovicell is a specialized zooid for defense called an avicularium. 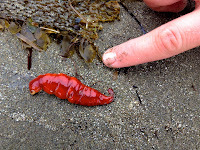 Ovicell and avicularium morphology vary within the genus, and can be used to key out species. 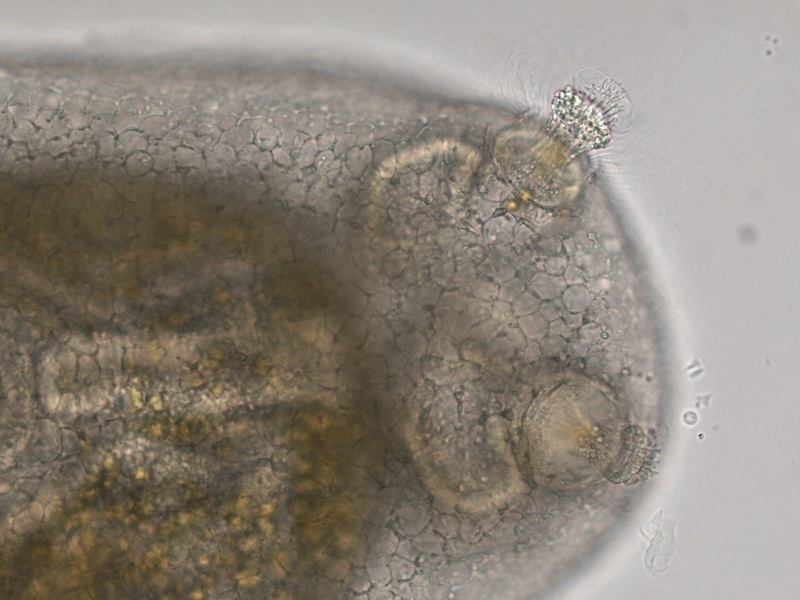 B. pacifica has reduced ovicells, so reduced that a well developed embryo cannot be contained and bulges into the maternal zooid (Giese et al. 1947). Developing embryos in Bugula apparently receive extraembryonic nutrition from the maternal zooid (Giese et al. 1947). Ovicells of cheilostome bryozoans vary in morphology and development which suggests that they may have evolved independently many times in this group (Giese et al. 1947). Schizoporella japonica pictured here, is another cheilostome bryozoan. 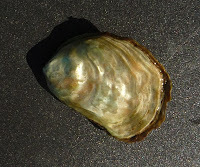 It is often found encrusting mussel shells and other substrata in NE Pacific marinas. 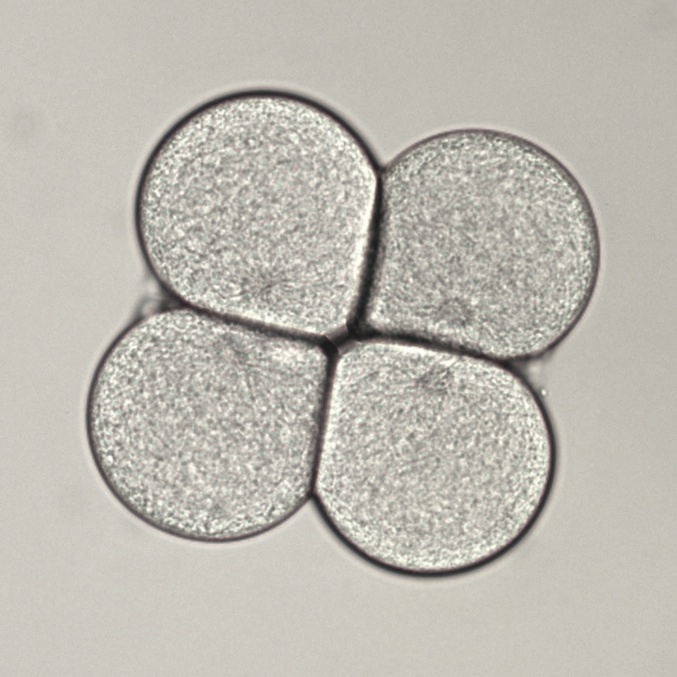 The ovicells are visible as small bumps on the surface of the colony, some with embryos (an orange mass inside) and some empty. S. japonica’s ovicells aren’t as intimate with the maternal zooids as in Bugula, and the embryos develop without the aid of extra-embryonic nutrition (Strathmann et al. 1987). 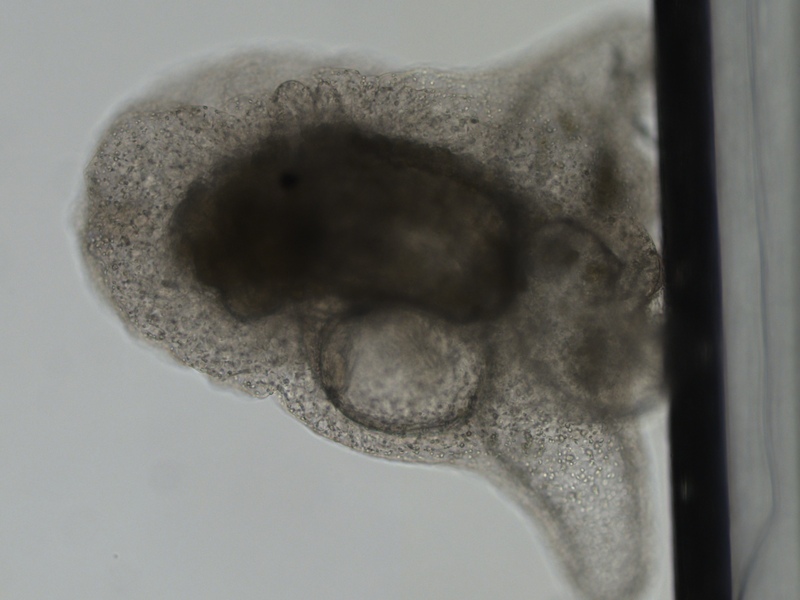 See a blog post by Dylan Cottrell about brooding of multiple genetically identical embryos (polyembryony) inside gonozooids in Crisia sp., a local stenolaemate. Below are pictures of early embryos of the ctenophore Beroe sp. Three adults were collected around Charleston docks near OIMB in mid-May and shed strings of ~ 220 µm eggs in the lab. 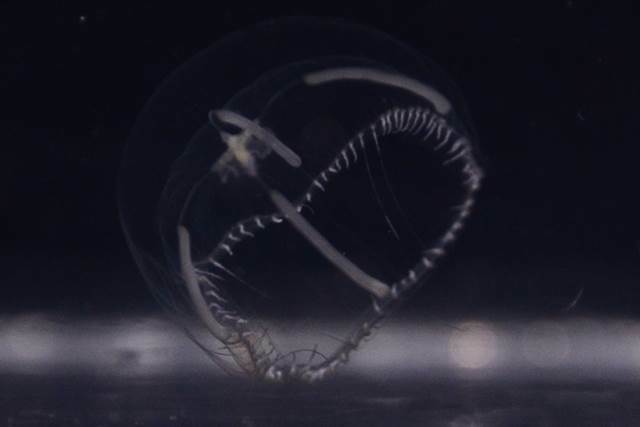 Ctenophore embryos are beautifully clear, and possess a unique type of development. 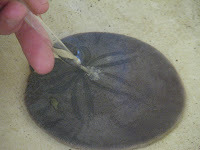 Like cnidarians, ctenophores have unilateral cleavage, which means that the cleavage furrow cuts in from one pole of the egg and gradually proceeds to the other side (see a video of cleaveage in another species of Beroe by George von Dassow). Ctenophore cleavage is stereotypical (all embryos exhibit the same series of highly ordered divisions), and the same cells consistently give rise to certain structures in the adult. Ctenophores exemplify mosaic development, which means that cell fates are determined early in development by inheritance of different regions of the egg’s cytoplasm which possess different properties. As a result, with few exceptions, when specific blastomeres are damaged, they are not replaced; and the embryo lacks the structures these blastomeres normally give rise to (Martindale & Henry 1999). 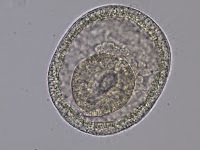 This is a gastrula of the same species of Beroe. Ctenophores undergo gastrulation by a variety of mechanisms simultaneously, including epiboly, delamination, invagination, and involution. 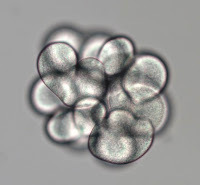 At the end of gastrulation large cells, called macromeres, end up surrounded by small cells called micromeres (see another video by George von Dassow). These embryos developed into little juvenile Beroe, pictured here, with beautiful red pigment granules in the epidermis. Another curious fact about the development of Beroe is that apparently, at least one species, Beroe ovata, can tolerate naturally occurring polyspermy (Carré & Sardet 1984). Polyspermy is a condition in which more than one sperm enter the egg. 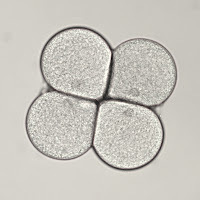 In most animals polyspermic embryos develop abnormally. However, Carre & Sardet (1984) demonstrated that in Beroe ovata the female pronucleus appears to preferentially select a sperm pronucleus with which to bind. The female pronucleus visits each sperm pronucleus, returning to the site of formation of polar bodies in between visits, and finally fuses with one of them (see video on Christian Sardet's website). The other male pronuclei are destroyed and do not participate in development which proceeds normally. Carré, D., Sardet, C. (1984). Fertilization and Early Development in Beroe ovata. Developmental Biology 105: 188-195. Martindale, M.Q., Henry, J.Q. (1999). Intracellular fate mapping in a basal metazoan, the ctenophore Mnemiopsis leidyi, reveals the origins of mesoderm and existence of indeterminate cell lineages. Developmental Biology 214: 243-257. Copepoda, with approximately 12,000 described species, is one of largest taxa of crustaceans and a large contributor in most plankton samples. This is particularly true of calanoid copepods, as most species in this group live entirely planktonic lifestyles. 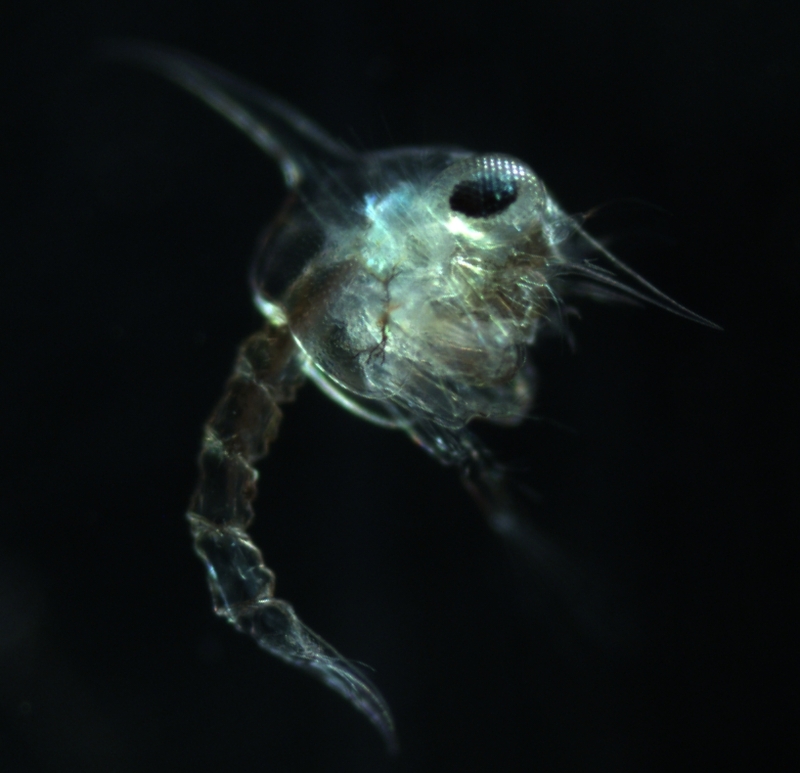 I collected the brooding calanoid copepod pictured here from a plankton sample taken in the Charleston boat basin. The anterior-most and longest appendages (first antennae) extend out of the frame of this picture. Some copepods release eggs into the plankton, but, as is the case here, many species carry their eggs in sacks attached to the abdomen. Note the two ovisacs laterally along the abdomen (the narrow posterior portion of the body) posterior to the thorax (the broad portion of the body) and anterior to the caudal ramus (the forked tail). 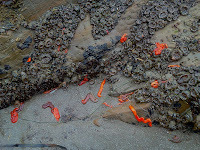 The second picture shows a close up view of the ovisacs. Inside the very thin transparent membrane of each ovisac (barely visible here) are 15-25 large eggs (each 70-80μm in diameter). The ovisacs are secreted by the epithelial cells lining the oviducts and are attached to the genital segment (the 6th thoracic segment fused to the 1st abdominal segment). Copepods in general are dioecious (meaning that they have separate sexes). During copulation males release spermatophores (sperm packages) and glue them to the female abdomen. Spermatozoa from the spermatophores then move into the female reproductive tracts and are stored there until they are needed. 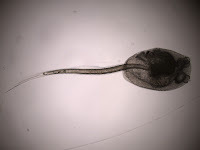 The eggs are fertilized internally on their way to the ovisacs where they will be brooded until they hatch as nauplii. 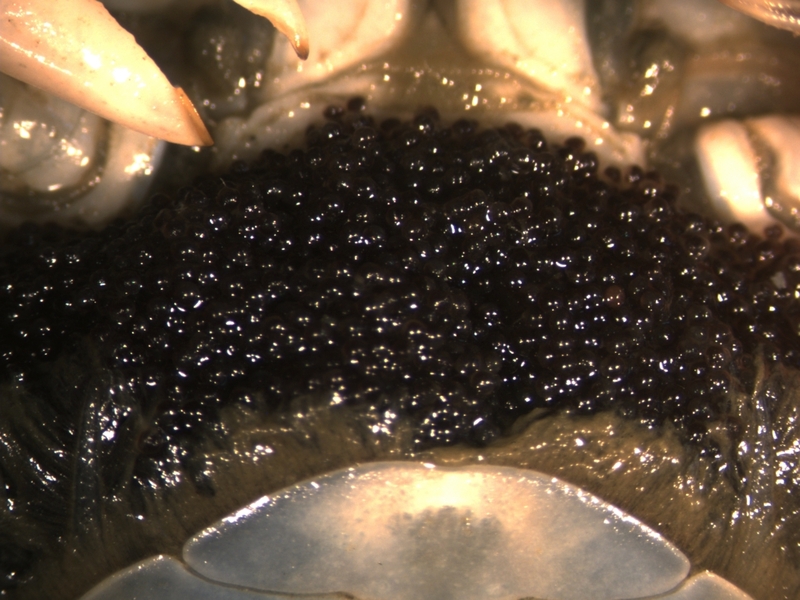 The nauplius larva pictured here hatched from just such a brood. It is about 270μm long. The nauplius hatches and swims using three pairs of head appendages: the first and second antennae, and the mandibles (from anterior to posterior respectively). The reddish blotch between the two first antennae is the naupliar eye. 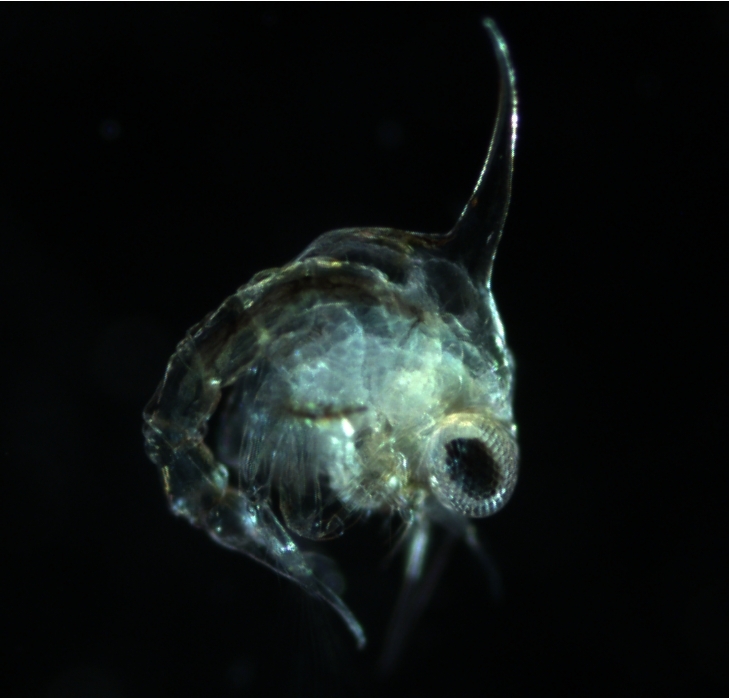 Copepod larvae go through six naupliar stages followed by five copepodid larval stages, molting between each stage. The mature adult no longer molts, and thus cannot grow. This is a picture of an adult nudibranch Aeolidia papillosa, found on the Charleston docks near OIMB. 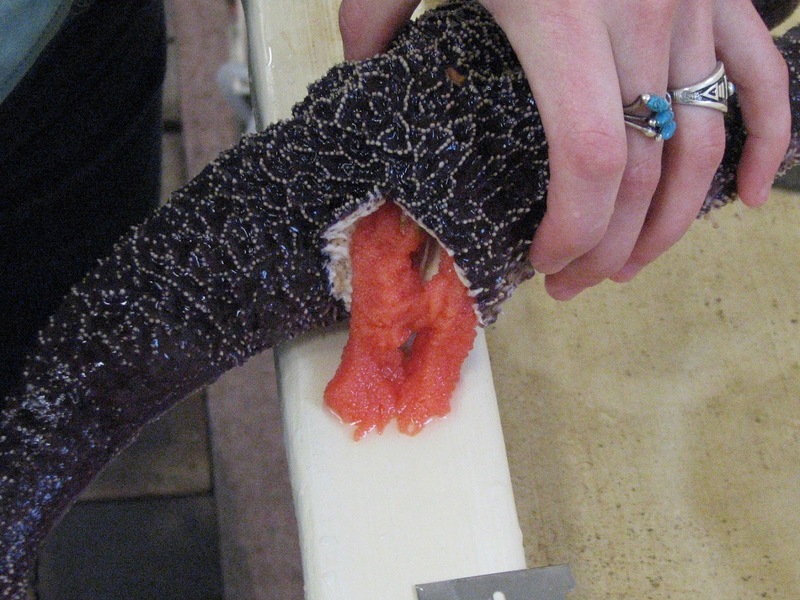 As with many other nudibranchs, A. papillosa package their eggs a few per egg capsule, the capsules embedded in a gelatinous ribbon, which are deposited as egg masses (pictured below). 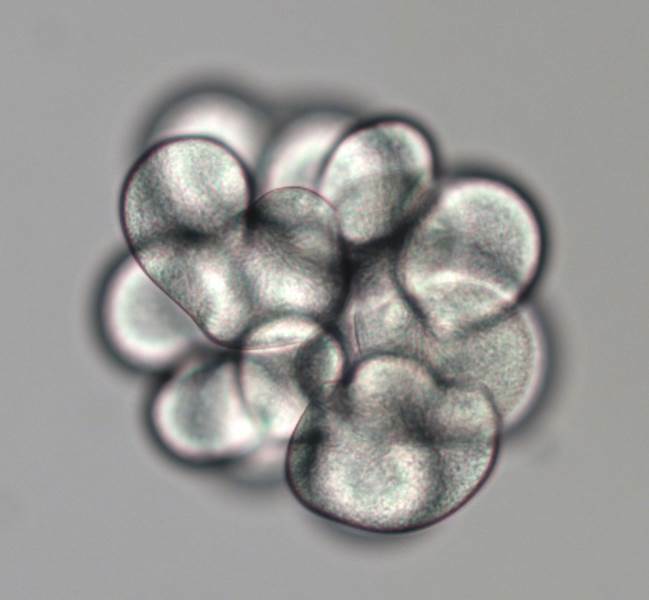 Early development is encapsulated, and embryos begin to move inside the capsule, before they hatch as shelled veligers (bottom picture). 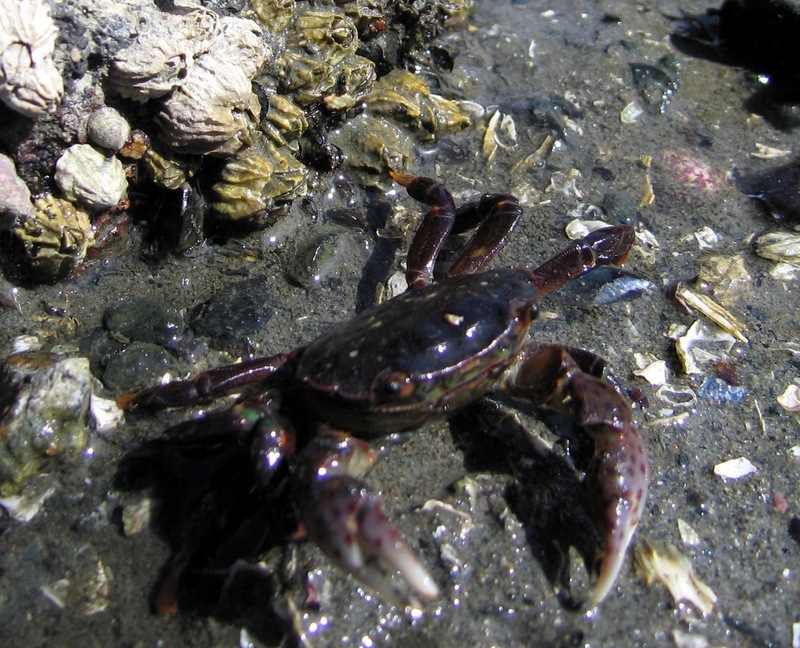 Many marine invertebrates are characterized by a particular type of development e.g. either lecithotrophic or planktotrophic (see Jon Gienger's blog post, Planktotrophy versus lecithotrophy). 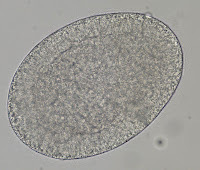 Interestingly, Aeolidia papillosa veligers hatching from the same egg capsule can be polytypic: some released as yolk-laden lecithotrophic larvae, and others as yolk-free planktotrophic larvae (Williams, 1980). Williams (1980) also noted that larvae that hatched without yolk reserves were, paradoxically, larger than those released with yolk reserves, although both types of larvae developed from uniformly small eggs. A simple explanation might be that because these two types of larvae develop within the same egg capsule, it is possible that the yolk-laden (slower developing) larvae are prematurely released from the egg capsule by their yolk-free (faster-developing) siblings. However, yolk-laden larvae hatched from egg capsules that did not contain any yolk-free larvae. 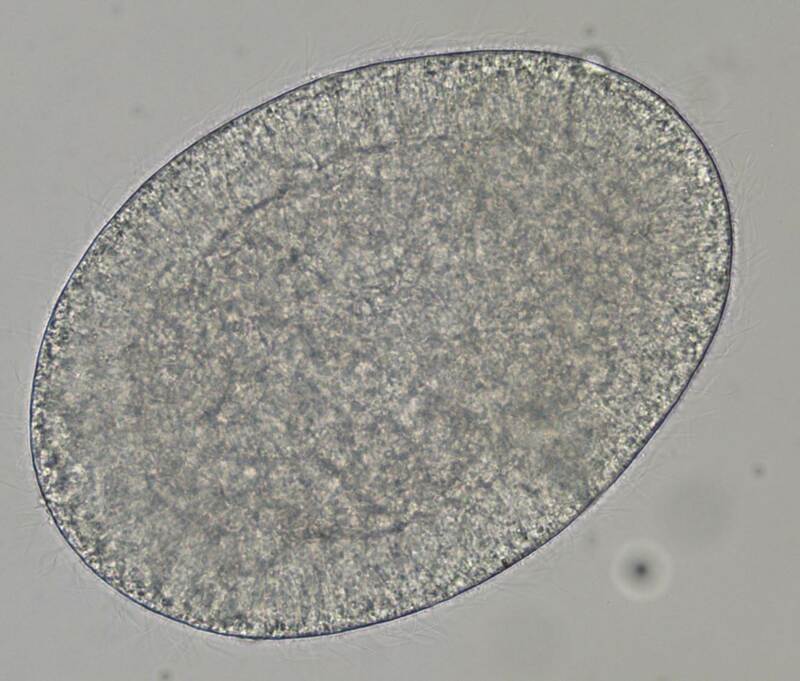 What’s more, smaller larvae were apparently less likely to feed on unicellular algae (e.g. Chlorella, Dunaliella) than their larger siblings. Both yolk-free and yolk-laden veligers were present in the egg masses I looked at, in addition to yolk-laden trochophores, indicating that larvae were still developing. One possible explanation for this polytypic development may be bet-hedging (varying strategy to increase the overall chances of offspring survival and success). 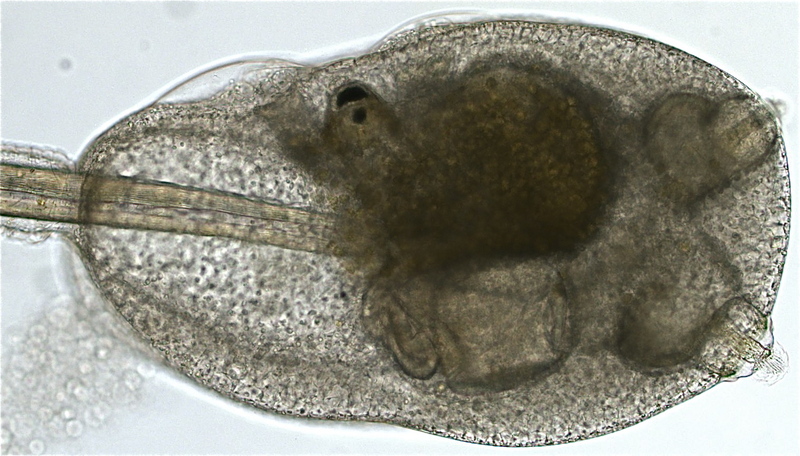 Lecithotrophic larvae are expected to survive to metamorphosis better than the planktotrophic under conditions of scarce food, whereas planktotrophic larvae may be more successful when phytoplakton is abundant. Producing both types of larvae may be advantageous when phytoplankton has spatially and temporally patchy distribution (Williams, 1980). Williams, L.G. (1980). 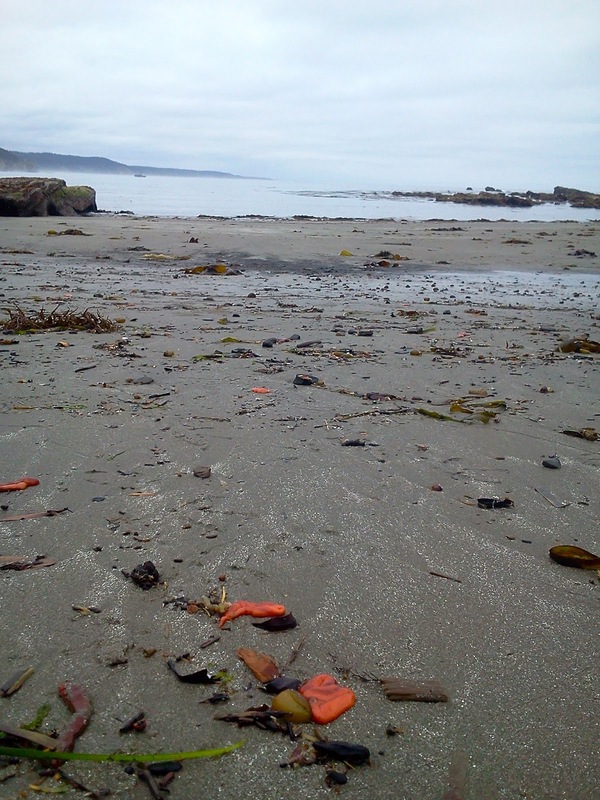 Development and feeding of the larvae of the nudibranch gastropods Hermissenda crassicornis and Aeolidia papillosa. Malacologia 20:99–116. 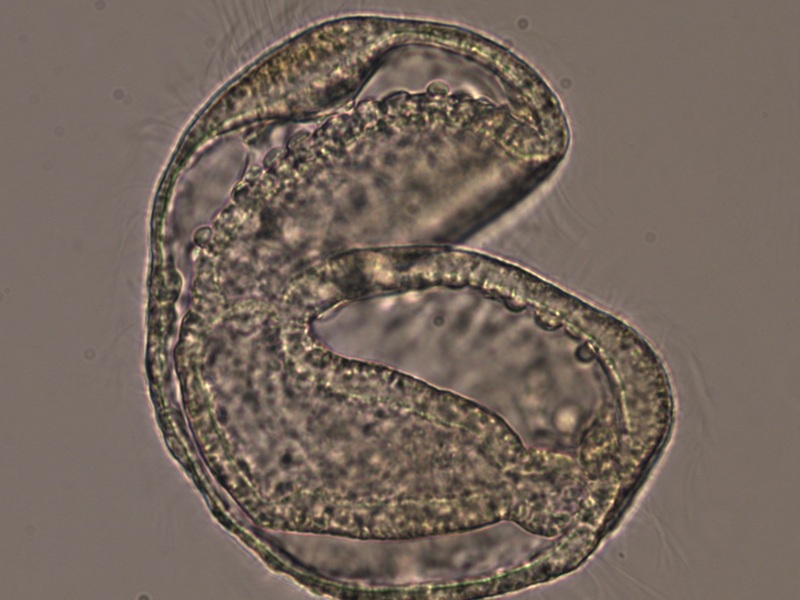 This is a marine rotifer from the genus Synchaeta (according to a key in Wallace & Snell 2010). Rotifers are a phylum of small, mostly fresh-water invertebrates. This adult individual is 0.7 mm long. 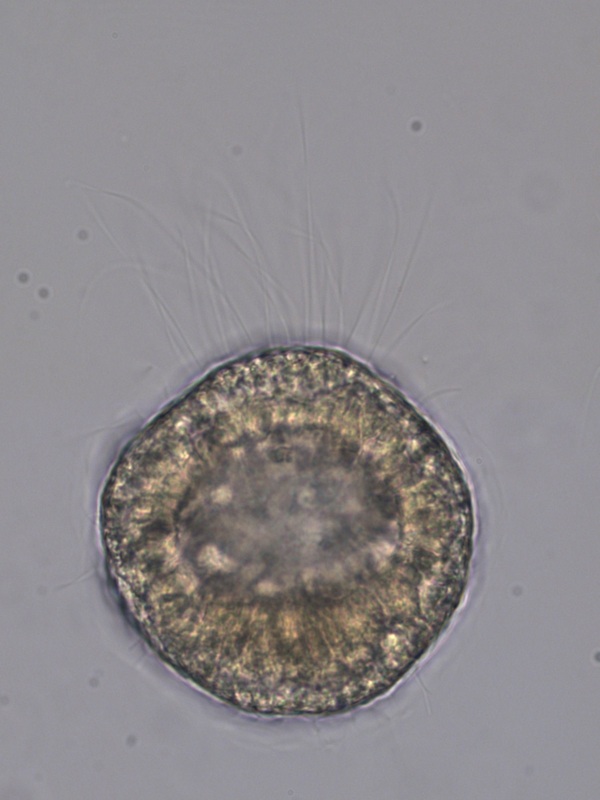 When I found it in the plankton sample, it was carrying two egg capsules attached to its foot (a little stalk at posterior end of the organism-see photo). While I watched it, one of the egg cases ruptured, releasing a fully formed and seemingly completely functional miniature (~ half a millimeter long) rotifer. 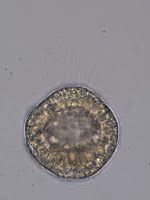 The empty case remained attached to the foot of the adult, while the newly hatched rotifer (shown below) began swimming immediately. Interestingly, rotifers can reproduce both sexually and asexually. One class, Bdelloidea, appears to lack males altogether (Wallace & Snell 1991). 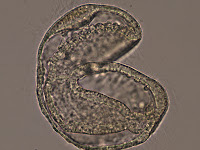 Sexes are separate in the Class Monogononta, to which the marine genus Synchaeta belongs. 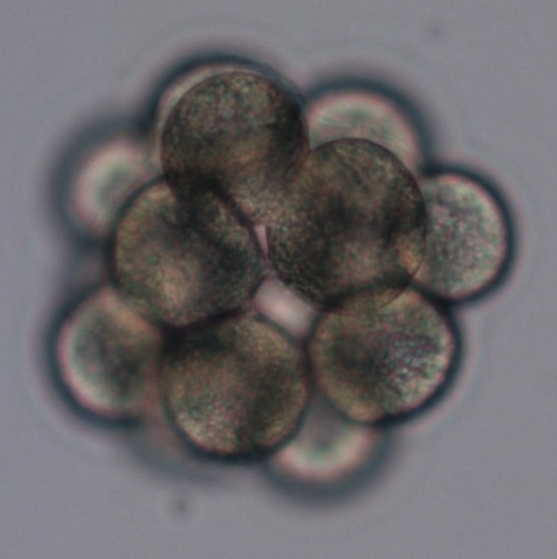 For the majority of the year, females produce offspring asexually by generating diploid embryos that develop without fertilization into females. Under certain conditions though, females produce haploid eggs. As in certain social insects (e.g. bees), if these eggs remain unfertilized, they develop into haploid males. 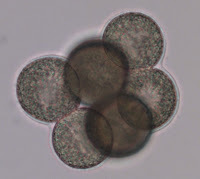 If fertilized, diploid eggs can remain in a diapause (resting state) for up to 20 years (Fradkin 2007), and eventually develop into females who feed and grow before becoming sexually mature (Ricci & Melone 1998). 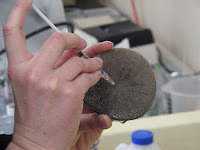 These resting eggs allow the population to outlive adverse conditions (e.g. desiccation, freezing etc.). Haploid males are sexually mature at birth, do not feed and live a short life (usually about half as long as females) with the apparent sole purpose of fertilizing females via hypodermic insemination (Ricci & Melone 1998). Another fascinating fact is that most rotifers have constant cell numbers as adults (~ 1000) (Fradkin 2007). In other words, no cell divisions take place after embryogenesis is completed, and growth is accomplished solely by enlarging existing cells. In contrast, humans start out as one cell, but end up with trillions in the adult body, the vast majority of which are born post-embryonically. 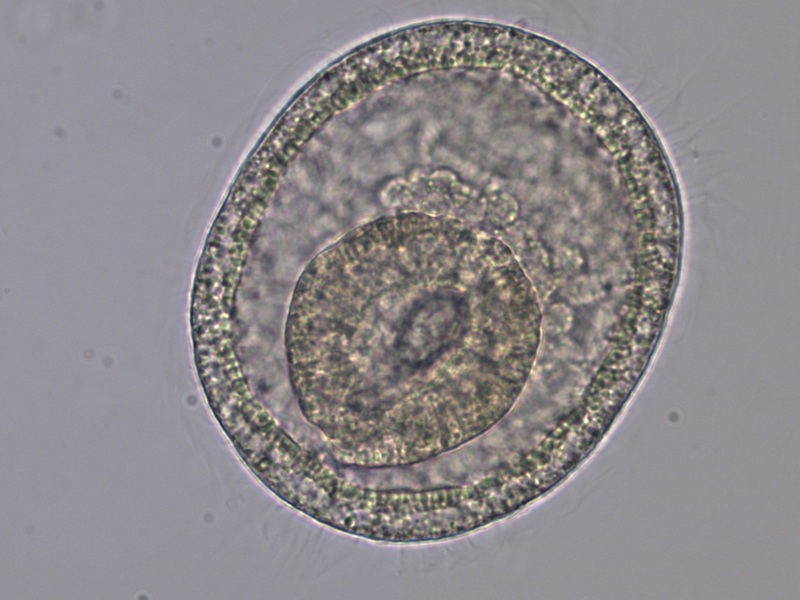 Additionally, in some asexually reproducing rotifer genera, generational clones have progressively shorter life spans (i.e. daughters live a shorter life than their mothers, grand-daughters live even shorter, and so on), which eventually leads to extinction of the line (see King 1969 for a review). 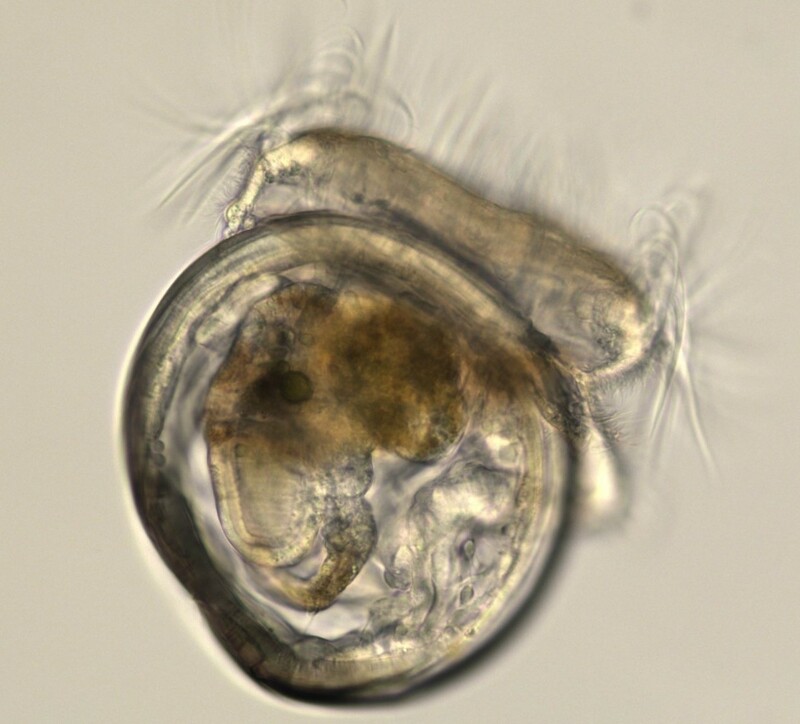 A dearth of information about development, distribution, and ecology in NE Pacific rotifers leave members of this phylum prime candidates for future research. Fradkin, S.C. (2007). Rotifera. 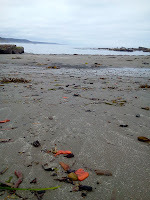 Light's manual; intertidal invertebrates of the central California coast. 4th ed. pp 280-282. J.T. Carlton (ed.). University of California Press. King, C.E. (1969). Experimental studies of aging in rotifers. Experimental Gerontology 4: 69-79. Wallace, R.L., Snell T.W. (2010). Rotifera. In: Ecology and classification of North American freshwater invertebrates. 1st ed. pp 173-235. J.H. Throp and A.P. Covich, eds. Academic Press. Ricci, C., Melone, G. (1998). Dwarf males in monogonont rotifers. Aquatic Ecology 32: 361-365.